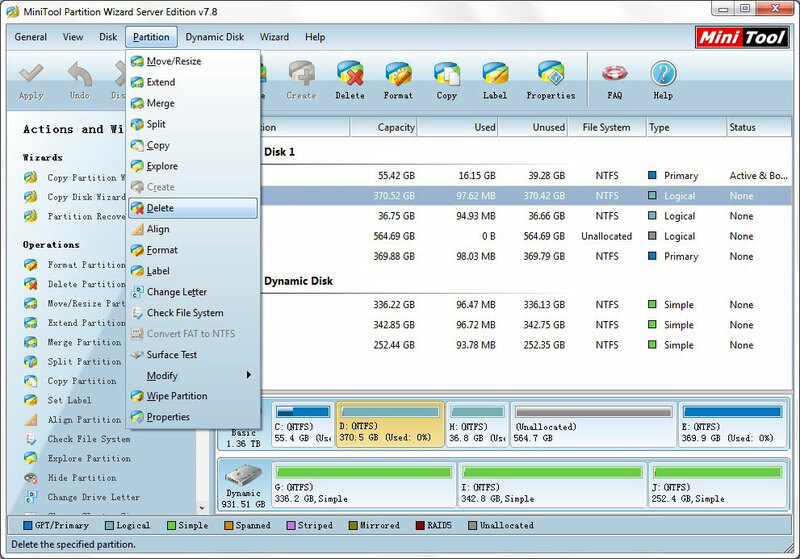 The best free partition magic for 64/32-bit Windows 7/Vista/XP - Partition Software Server Edition. Partition Software Server, an excellent partition magic server for Windows Server 2000/2003/2008/2008 R2/2012, is designed for Windows server system users to manage server hard drives, Advanced Format hard drives included, safely and efficiently. Besides, Partition Software Server still supports non-server systems like Windows XP, Windows Vista, Windows 7 and Windows 8. What's more, users will be free from data loss risk when using this partition magic server to manage disk partitions and dynamic volumes. On basic disk: Resize/Move partitions, Merge Partitions, Extend Partition, Split Partition, Change Cluster Size, Wipe Partition, Copy Partition, Copy Disk, Create partition and Delete partitions, Format partitions, Convert partitions, Explore partitions, Hide and Unhide partitions, Set active partition, Convert Dynamic Disk to Basic Disk, etc. On dynamic disk: Move/Resize Volume, Change Volume Cluster Size, Create Volume, Delete Volume, Format Volume, Change Volume Label, Change Volume Letter and Wipe volume, etc. Convert NTFS to FAT. New! Convert MBR Disk to GPT Disk. New! Convert GPT Disk to MBR Disk. New! Copy Dynamic disk volume. New! Convert GPT-style Dynamic Disk to Basic. Move Boot/System volume for Dynamic Disk. Extend partition with one step. Split one partition into two safely. FULLY Support 4096-byte-sector-based hard drive. Align all partitions or align a specified partition to optimize hard drive performance. Full support Windows Dynamic Disk Volume. Hide and Unhide Partitions, set active partition, label drive letter. Convert Dynamic Disk to Basic Disk. What are basic and dynamic disks?